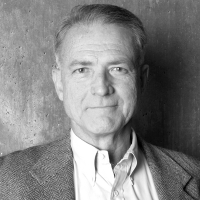 When: Friday, Nov. 21, 2014, 6:30 to 8:30 p.m.
Public invited to hear Mathias Kondolf of Berkeley, leading voice in national debate over river restoration industry, on Friday, Nov. 21, at 6:30 p.m.
Houston, TX, Nov. 8, 2014—Mathias Kondolf of Berkeley, one of the world’s foremost river scientists and a leading critic of the often-failing methods proposed for the controversial $6 million project to dredge and channelize one of the last natural stretches of Buffalo Bayou in Houston, will give a public lecture in Houston on Friday, Nov. 21, 2014. Dr. Kondolf will speak about the natural process and dynamics of river systems, the importance of riparian zones, and the state of Buffalo Bayou in particular. He will address the prospect of failure and the lack of science underlying the experimental techniques proposed by the Harris County Flood Control District for the bayou project and place the controversy in the context of the ongoing national debate about river restoration and so-called Natural Channel Design. The public presentation will be at St. Theresa Memorial Park Catholic Church, 6622 Haskell, from 6:30 to 8:30 p.m. All are invited. There will be an open question-and-answer period. Riparian Buffers: What Are They Good For? A workshop in Houston, Monday, Nov. 17, 2014, about the benefits of riparian buffers. Let’s hope they discuss the importance of riparian buffer right here on Buffalo Bayou. Speakers include representatives from Texas Forest Service, Natural Resource Conservation Service, Texas Water Resources Institute—and Harris County Flood Control, which plans to demonstrate erosion control by ripping up riparian buffer on the bayou. Should be an interesting workshop. Sponsored by the Houston Galveston Area Council. 10 am to 12 pm, 3555 Timmons Lane, Suite 120, H-GAC Conference Room A, Second Floor. Here’s an example of what happens to landowners who raze the riparian buffer on their property. 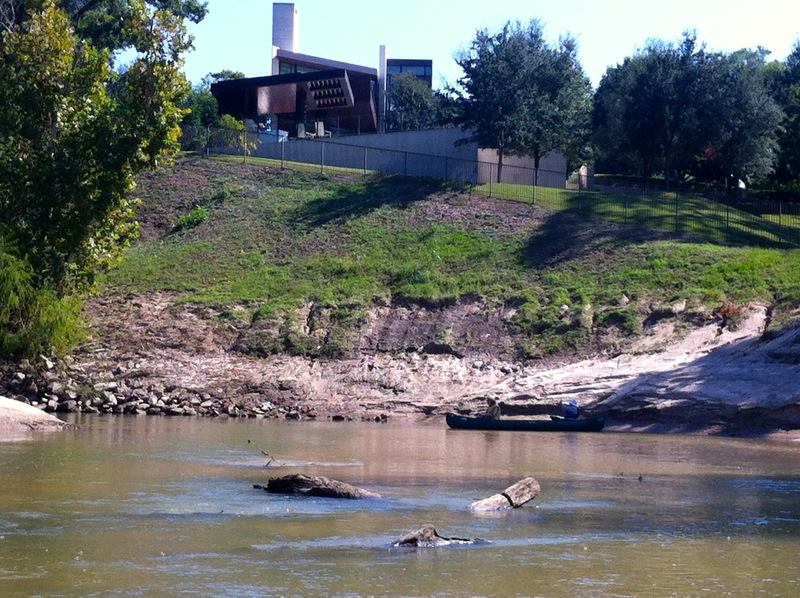 The lovely River Oaks property featured below once had riparian forest protecting its sloping banks on Buffalo Bayou. The new owner built a new house and cut down the buffer, likely for the view of the river, and planted grass. The photo on the left was taken at base flow (low water) on July 12, 2014. The photo on the right was taken, also at low flow, from the same angle although slightly farther away on Oct. 24, 2014. This property is immediately adjacent to the project area where the Harris County Flood Control District and the Bayou Preservation Association plan to demonstrate erosion control to property owners on Buffalo Bayou by eliminating the riparian buffer. The project is known as the Memorial Park Demonstration Project. The same property on Oct. 24, 2014. Photo taken farther away but from the same angle and approximately same water level. 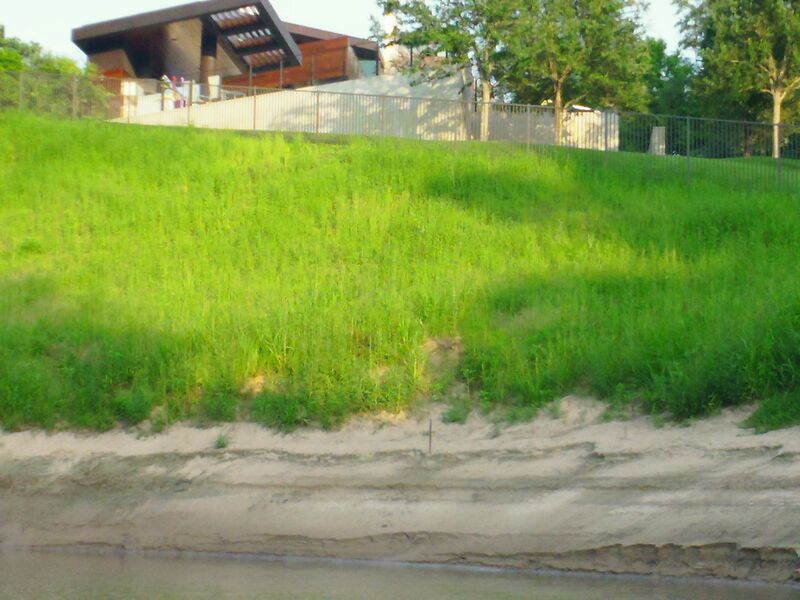 Riparian forest buffer was cut down and replaced by grass on this sloping property on Buffalo Bayou in River Oaks. Photo taken July 12, 2014. When is a Public Boat Launch Not a Public Boat Launch? A boat launch is no longer a boat launch after the City spends $1.3 million designing, building, and landscaping it and doesn’t include access for the people and their boats. That’s the explanation from representatives of the parks department and the Uptown TIRZ 16 for why the once-popular official Parks and Wildlife boat launch at Woodway in our Memorial Park remains fenced-off and closed to the public more than six months after it was transformed into a massive drainage outfall. The maintenance ramp cleared of mud at the Woodway not-a-boat launch on Nov. 1, 2014. It’s not safe for people, says the City. 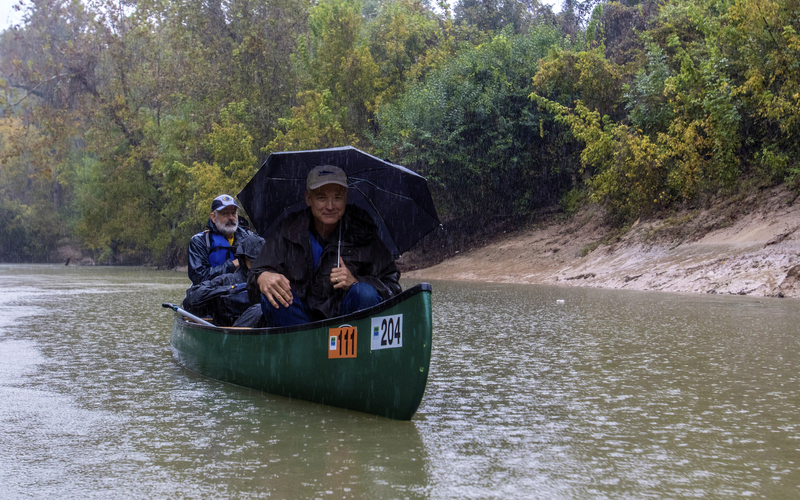 Coincidentally, being able to put in at Woodway allows the public to float down Buffalo Bayou through the historic natural area that the City and County want to obliterate. That nearly 1.5-mile stretch of the river further downstream is one of the last remaining wild reaches of our 18,000-year-old mother bayou. So keeping the put-in closed makes it more difficult for people to see the majestic very old cliffs, lovely forested banks, and sandy beaches of this little known wilderness area that will be destroyed. Officially it’s not a boat launch at all, which is why it is closed, although it might be a boat launch again sometime in the future, according to Rick Dewees, assistant parks department director in charge of Memorial Park, and Sarah Newbery, the Uptown TIRZ 16 project director for the Memorial Park Master Plan. The Uptown TIRZ 16 financed the project at Woodway with taxpayer funds. But wait, what’s that gently sloping, winding paved ramp leading down to the water? 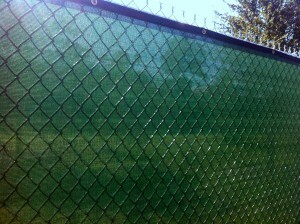 That’s not for people; that’s only for maintenance trucks, said Dewees. Newbery agreed. Will the New Memorial Park Master Plan Be for the People? Public Meeting Monday, Nov. 10, 2014, on proposals for a new Memorial Park Master Plan. 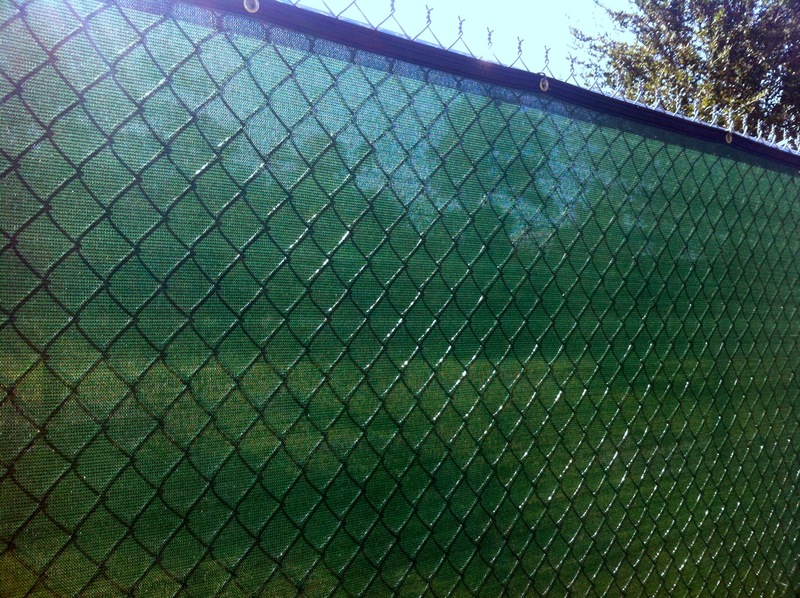 The prison-grade fence preventing public access to the $1.3 million SWA Group- landscaped not-a-canoe launch and secret wild woods with spring-fed pool in Memorial Park west of 610. The Memorial Park Conservancy, Houston Parks and Recreation Department, and the Uptown Houston TIRZ are holding the second of four community meetings Monday, Nov. 10, 2014, about proposals for a new $1.8 million Memorial Park Master Plan. The meeting will be from 6:30 to 8:30 p.m. in the White Oak Conference Center, 7603 Antoine Drive, 77004. Go and ask them why they have locked up an entire forested section of our Memorial Park south of Woodway west of 610 and closed off access from there to Buffalo Bayou, access that historically had always been open to the public. The landscape architecture firm of Nelson Byrd Woltz is leading the development of the new master plan. The City of Houston and the Uptown TIRZ plan to spend $100 to $150 million in tax money on capital improvements to the park in the next twenty years. None of that money is for park maintenance. 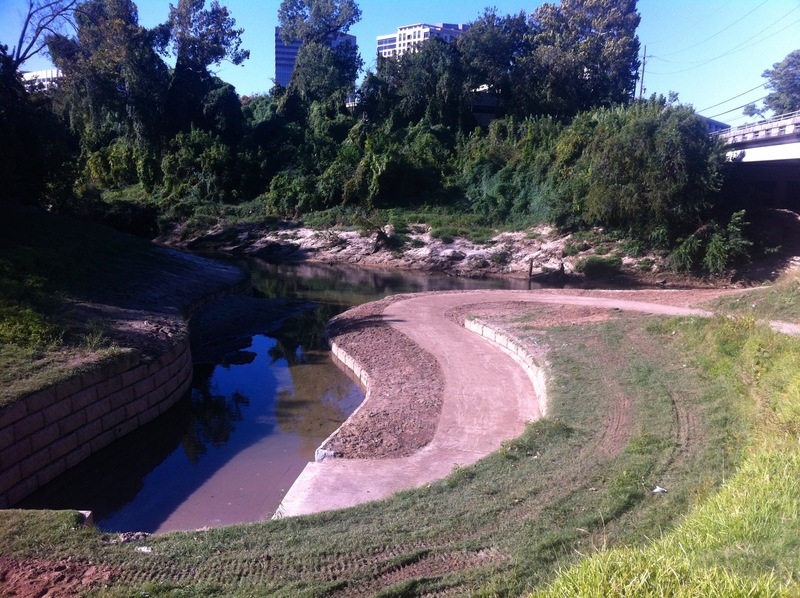 Why Is the City Shutting Off Access to Buffalo Bayou in Memorial Park? 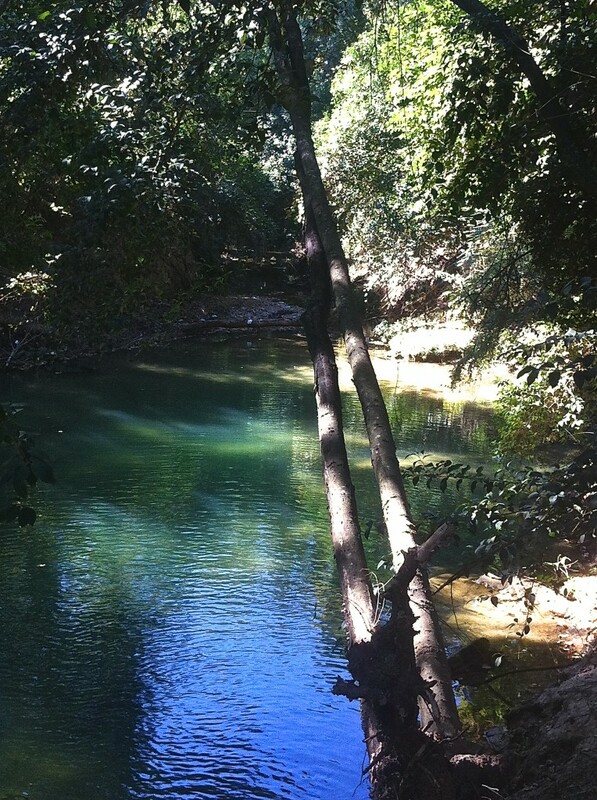 The secret pool hidden behind a closed fence in Memorial Park. This lovely pool in the woods is filled with clear water from a spring-fed tributary of Buffalo Bayou. Photo by Susan Chadwick, Nov. 1, 2014. We were exploring in the woods yesterday (Saturday, Nov. 1, 2014) behind the “prison-grade” apparently permanent fence now surrounding the mysteriously closed $1.3 million not-a-canoe launch, “erosion control” project and drainage outfall in Memorial Park just south of Woodway. This is the park area just west of Loop 610 that used to be called the Archery Range because it was in fact used as an archery range from the 1950s until about 1988. The bayou here was the site of an old sandstone ford near the current Woodway Bridge that was known in the nineteenth century as Dutchman’s Crossing, and the woods contain the remnants of a large brick kiln (and bricks), charcoal manufacturing, and antebellum market garden, orchard, and plant nursery dating from about 1838 to the 1930s, according to landscape architect and historian Janet Wagner. We were looking for the much newer paved pathway that until recently led to the bayou from Woodway and that only a few years ago was used by the sporting public to haul and unload their canoes and kayaks on the banks of the bayou underneath the 610 bridge. For some reason the entire wooded area has been fenced off and the public pathway we were looking for has been eradicated. Only a few pieces of concrete remain, lost under the overgrowth.